This site is occasionally prepared to stray outside its execution-anniversary beat to cover especially fascinating manifestations of the death penalty in history. So for this date, we observe the anniversary not of a punishment, but of the crime itself: a capital homicide in the capital of the world that changed art forever. Caravaggio’s Judith Beheading Holofernes, 1598-1599. 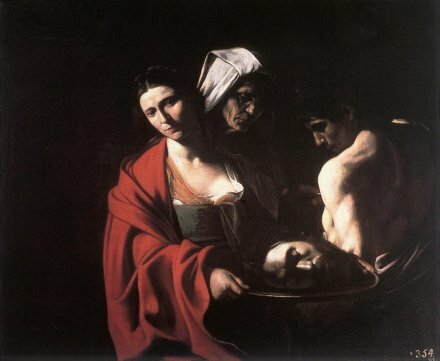 Though the young painter on the make would hardly want for models of public decapitation in 16th century Rome, the gendered intimacy with the act invites consideration of Caravaggio’s likely attendance at the execution of Beatrice Cenci. … made him a rock star on the canvas. 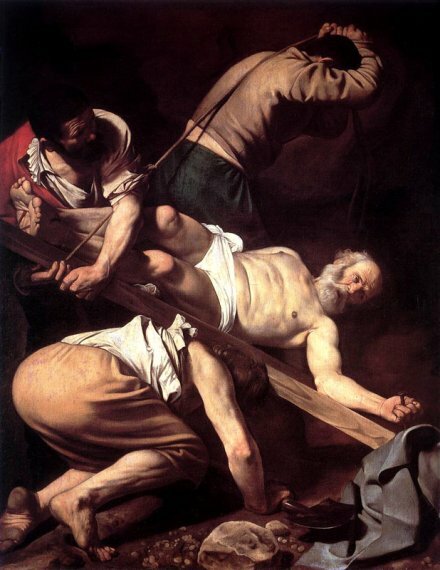 Caravaggio’s Crucifixion of St. Peter, painted in 1601 for Rome’s Santa Maria del Popolo. 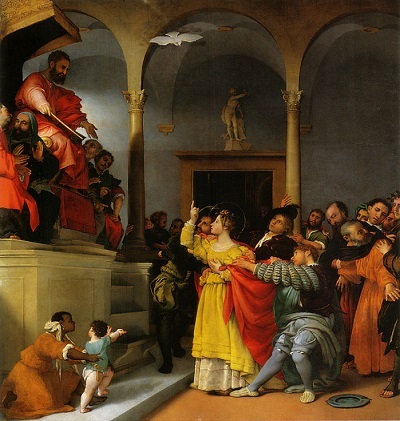 However many souls his stark brushwork won for the Church, Caravaggio’s reverential fare belied the creator’s own distinctly profane pastimes: gambling, boozing, brawling, and whoring around. He needed the intervention of well-placed patrons to duck prosecution on several occasions. 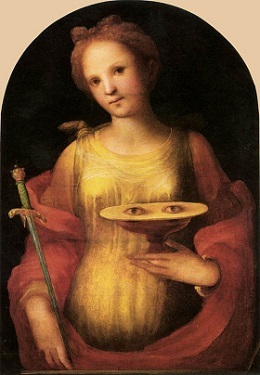 May 29, 1606 finds our “temperamental” antihero encountering a wealthy scoundrel by the handle of Ranuccio Tomassoni and a problem that would outstrip any political pull the artist could muster. 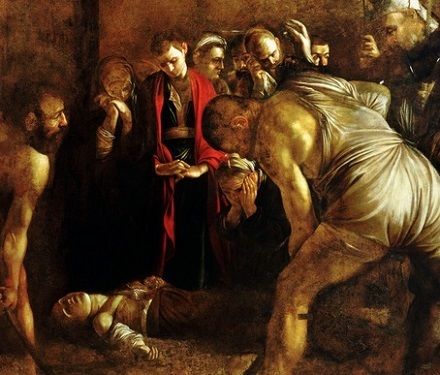 Condemned an outlaw by Pope Paul V — himself fruit of Rome’s Borghese family, great patrons of art in their own right — Caravaggio fled the Eternal City. His brilliance went with him, perhaps even amplified by the exile. The painter and killer had four years left to him — an exile spent sleeping clothed and armed, forever looking over his shoulder. But what his jangled nerves could still spare for the canvas would help launch the baroque artistic epoch and still influences us today. Flight, fancy, and fortune took Caravaggio to Malta and to Sicily, but the year or so he spent as Naples’ visiting genius would make his artistic legacy: that city’s succeeding generations of painters took enthusiastic inspiration from Caravaggio’s Neapolitan offerings — like a Seven Works of Mercy that must have carried a very personal meaning for the hunted man. He was reportedly as arrogant and hot-tempered on the run as he had been in Rome, but Caravaggio’s art in exile also traces his desperate attempts to undo the consequences of his bad behavior. Exploiting his apparent affinity for the sawing off of heads, Caravaggio rendered his own head in a severed state in at least two apparently penitential paintings during this vulnerable period. 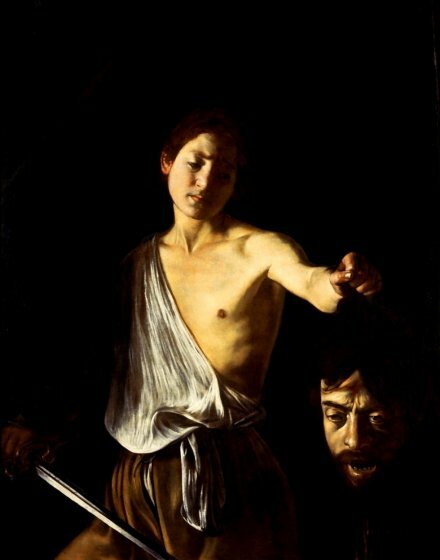 While David with the Head of Goliath seems to have been created shortly before Caravaggio’s own death for the pope’s art-hounding “Cardinal Nephew” Scipione Borghese, in a bid to earn a pardon. Caravaggio’s self-portrait as the dead man, and Latin inscription “humility kills pride” on the Israelite hero’s sword, suggest an attempt to effect through his creative virtuosity his own execution in effigy. That would be, at any rate, the only execution Caravaggio ultimately had to endure. He died in the summer of 1610 under unclear — and inevitably suspicious — circumstances while attempting to return to Rome. * Ranuccio Tomassoni was the pimp and lover of a prostitute named Fillide whom Caravaggio had painted years before, and become enamored of. 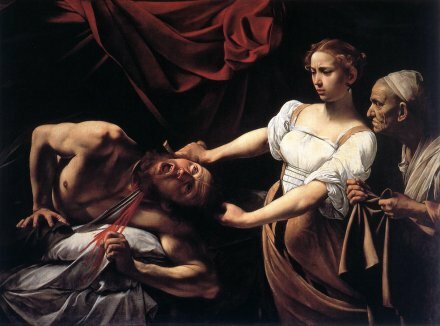 This Fillide was also Caravaggio’s model for Judith in the arresting painting of the Biblical heroine in mid-decapitation above. ** Possibly, if you like the love triangle angle, in a botched attempt to castrate his rival.